My famed wanderlust has been in overdrive lately and after days of pestering, the husband relented and I booked us for a one day getaway to the Yadkin Valley for some wine tasting madness. As most of the valley is within 2-4 hours of the Triangle, you could easily make a day trip out of it but I find I prefer to have a place to bed down nearby after lots and lots of sips of wine. 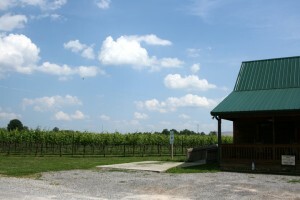 All of the wineries we hit on the first day were easily accessible off US 421. Tastings ran between $3-12, depending on how many wines you wanted to sample and all included a free wine glass. Note to vineyard owners: I’d really rather have cheaper wine tastings than get more glasses to add to my bursting cabinets at home. Anyhow, we set out on Saturday morning. We took I-40 out west for around 1.5 hours before hitting US 421. The first winery road sign appeared not long afterwards. Westbend Vineyards was a welcome sight after a couple of hours driving. It definitely had one of the most pleasing outdoor seating areas of the bunch. We walked out with a bottle of their Pioneer White and Le Noirian. It’s worth mentioning that if you, like us, hadn’t tried the wine of Yadkin Valley before, it is much, much less sweet than the wines you can find closer to home. Never once did I hear the words “muscadine” or “scuppernong” while we tasted, and I have to say, I am glad for it. Those two native NC grapes typically create wines that are way too sweet for me. Not one of these places offered a fruit wine either, which again, was a nice change from wineries closer to home. Fruit and sweet wines can be great; I’ve just gotten tired of tasting them and appreciate the more traditional wines that the Yadkin Valley offered. Our second stop was at Hanover Park Vineyard, about two exits up the road. The tasting room is housed in a lovely old building with a cocker spaniel ready to great you at the door. We walked away with a bottle of Mourverdre and Port Hanover but not before strolling around their vineyard. 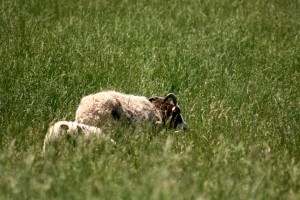 Their long-horned sheep are a must see. Next up, we hit two wineries off of exit 267. 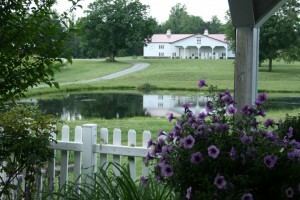 Closest was Laurel Gray Vineyards, which had a lovely barn and a fantastic porch area. We went for a bottle of their Cabernet Sauvignon before walking slowly through the porch and back to our car. 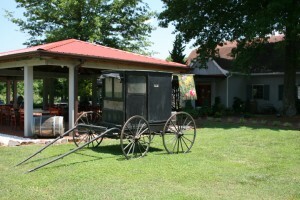 Just a few miles away was Buck Shoals Vineyards, with a large cabin serving as its tasting room. Buck Shoals has two meads on their tasting menu and we were impressed that they were fairly dry, having only had rather sweet ones before. We headed out with a bottle of the Shoals Creek Gold Honey Mead and their Chambourcin. As you can tell by now, we buy wines for drinking, not for storing! We headed to the Fairfield Inn & Suites in Elkin next, just about 20 minutes up the road off I-77. This place was a great deal at $90 a room and I loved that their decorating was much more modern than the standard hotel patterns that make you want to gouge your eyes. Breakfast is included and they have a lovely rock fireplace and fountain, in addition to a pool, Jacuzzi, and exercise room. Definitely a good place to stay in Elkin! For dinner, we went to Twenty One & Main, one of the few upscale restaurants in the area. It was located right at the main corner of downtown Elkin and was a pretty good meal though my shrimp and grits could not compare to the ones I recently had at Tyler’s Tap Room in Durham. Those were phenomenal. The next morning, we started at Elkin Creek Vineyard, one of the most scenic wineries of the bunch. There were free kittens on the porch, a festival being setup, and lots of lovely grounds to stroll around. The owner’s daughter was actually playing a game of King’s Corners, a card game that very few people I’ve come across know. Yes, card game knowledge impresses me greatly. From Elkin Creek, we bought a bottle of chardonnay and their dessert wine. 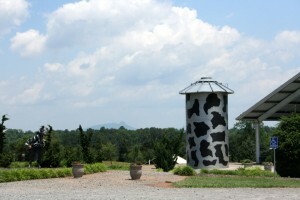 Last on the list was RagApple Lassie Vineyards, which definitely enjoys a cow theme. The tasting room is in the same industrial building as at least some of their vats, which takes away some hominess but the enjoyable tasting made up for it. We only ended up with their “Oh my, God!” picnic red wine, named thusly because it was packaged in the wrong bottle. I think this was due to my tastebuds and credit card being worn out by this point. There were definitely more winners in the bunch. What I’ve learned about Yadkin Valley is 1. It’s much closer than I thought! 2. The wines are much more amenable to my palate. I like a mix of dry and lightly sweet wines and it was great to try more local wines that fit that. 3. 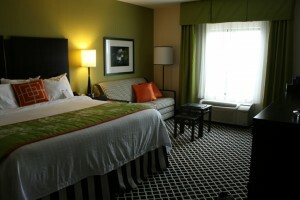 Fairfield Inn is a great place to stay in the area and 4. A weekend spent wine tasting is a weekend well spent. For more pictures from our weekend, check out our photo website. 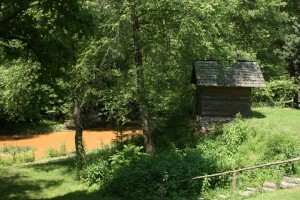 My wife and I just visited the Yadkin Valley for the first time last year. It’s great that at many of the wineries we visited, the owner/farmer was the person giving the tour or pouring the wine for our tastings. It makes for a very intimate, personal experience. You visited several wineries we missed, and I’ll be adding them to the list for our next visit. We did visit RagApple Lassie and Buck Shoals. I may have to try a bottle of the “Oh My God” from RagApple Lassie. We were similarly impressed with the dry mead from Buck Shoals. One winery I would recommend visiting is Shelton Vineyards. It’s one of the oldest (at about 10 years old) in the area, and has some good wines, and an impressive tasting room/gift shop. They also have a very nice restaurant, which is where we ate when we visited the area. 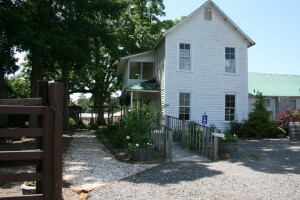 We stayed at the Rockford Bed & Breakfast, an old farmhouse in a little town in the Yadkin Valley. Friendly hosts and delicious breakfast.